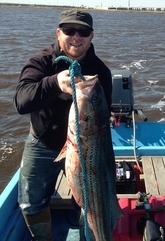 2019 Absecon Bay Sportsman Center, 1st Striper of the Season Contest. 1st Legal Striper Release of 2019. Go Live on Facebook and measure and release a striper over 28”. 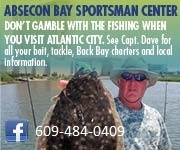 Share the saved LIVE Video to Absecon Bay Sportsman Center www.facebook.com/abseconbay , win a $100 Gift Certificate. 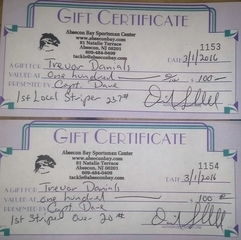 I will not be giving out Gift Certificates for the first, 20# and 30# stripers this year. I believe everyone should be able to catch, keep and show off a legal fish, however I do believe that we should be changing to a slot limit regulation and everyone should be encouraged to release large breeding females. I am adding one additional, requirement to prove you are a Fan you must Post a Picture of your fish to the Facebook page, before you weigh it in. Fisherwomen, get into the act. The First Female Angler to weigh in a Legal striped bass will win a Shakespeare 7' Lady fish Combo. All weigh ins must be during regular store hours. No weigh-ins before 6 am. March 1st. (I do expect legal fish will be caught) If more than one fish is waiting in the lot at 6 am. I expect that they will be gentlemen or women and accept their appropriate place in the tournament. Capt. Dave Showell will be the Judge and Jury to see that all regulations in this tournament are followed. public domain and used accordingly. 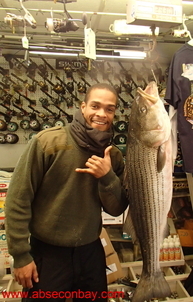 It took until just after noon for the first Striped bass to come thru the door. Donovan Vasquez caught this 9.4#. 30" Mullica River Beauty on a bloodworm. He said he didn't know how many shorts he had to cull thru to get it, but the action is constant. He did pick up a few White Perch between the aggressive short Stripers. With his winnings he picked up a really nice combo. A Penn Clash 4000 on a Tsunami Classic Rod with a full spool of 30# Power Pro. Also prizes for kids and the 1st woman to catch a keeper so keep on fishing. 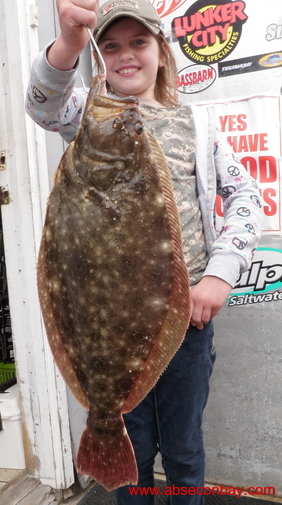 ATTENTION ALL PARTICIPANTS: To win the entire $200 Gift Certificate or any other prize, You must submit reasonable proof that you caught your fish in waters of South Jersey not connected to influence of the Oyster Creek Nuculear Power Plant. Since almost everyone carries a phone with a camera with them I suggest you immedialtey take a picture and send to me when the fish is first caught. Any fish taken from the influence of the Oyster Creek Nuculear power plant before... a "Cold Water Fish" will be entitled to 1/2 of the appropriate prize and the remainder will be awarded to the 1st "Cold Water Catch" or the next in line. It is up to you to PROVE to me, Capt. David Showell, beyond a reasonable doubt that you did infact catch a fish in the "Wild" environment. If you do not want to give away your Fishing Zone, then you will settle for half the prize. This Contest will continue until all prizes have been awarded. 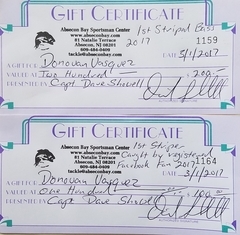 Besides the regular prizes, just like last year I am offering an additional $100 Gift Certificate to the first Facebook "Fan" that also is registered at the Facebook "Event", 1st Striper 2015 and brings in a Legal Striper Bass. So CLICK the "INTERESTED" Button and then drop down to "GOING" to register for the FAN Prize. I am adding one additional requirement to prove you are a Fan you must Post a Picture of your fish to this page, before you weigh it in. The first Boy and Girl 12 years old or under to catch and weigh in a Striper over 28" will win a Rod and Reel combo to help them catch their next one. Tell Mom and Dad that you've got to go fishing..
All weigh ins must be during regular store hours. 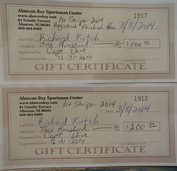 Absecon Bay Sportsman Center 1st Striper of the Season contest. Any fish taken from the influence of the Oyster Creek Nuculear power plant before a "Cold Water Fish" will be entitled to 1/2 of the appropriate prize and the remainder will be awarded to the 1st "Cold Water Catch"
It is up to you to PROVE to me, Capt. David Showell, beyond a reasonable doubt that you did in fact catch a fish in the "Wild" environment. If you do not want to give away your Fishing Zone, then you will settle for half the prize. 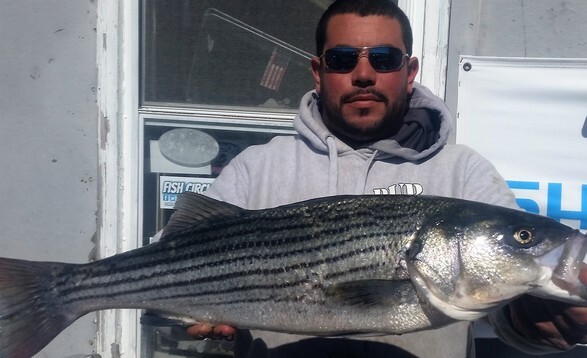 1st In NJ: Mathew Calebria 3/1/2016 29"
Besides the regular prizes, just like last year I am offering an additional $100 Gift Certificate to the first Facebook "Fan" that also is registered at the Facebook "Event",1st Striper 2015 and brings in a Legal Striper Bass. So go to the "EVENT" Page and CLICK the "INTERESTED" Button and then drop down to "GOING" to register for the FAN Prize. I am adding one additional requirement to prove you are a Fan you must Post a Picture of your fish to the Facebook Page, Send a picture in a Facebook Message, or Email to go-fish@abseconbay.com , before you weigh it in. Even if you don't catch the first Striper of the season, or win one of the other prizes, I am adding another prize to the pile: The First Female Angler to weigh in a Legal striped bass will win a Shakespeare 7' Lady fish Combo. Remember all prizes are available until the fish are weighed in at the shop. Even if it takes to the 4th of July, (I hope not) All weigh ins must be during regular store hours. The first Boy and Girl 12 years old or under to catch and weigh in a Striper over 28" will win a Sea Striker Rod and Reel combo to help them catch their next one. Tell Mom and Dad that you've got to go fishing this weekend. This page will be reserved for information on Open Tournaments available to the competative angler here in South Jersey. I personally enjoy competing, but it is often difficult to get free to give it a good shot. I also participate as sponsor for several of the local benifit tournaments such as the Ladies Bluefish Tournament, The Greater Atlantic Bluefish Tournament and several of the Hooked on Fishing not on Drugs Kids Tournaments. If you or your group Is running a Fishing event of any kind I'll be happy to promote it for you and help out any way I can. Weakfish will be back in contention again after last years single weigh in and great summer weakfishing. Fishing can start 12 am May 18th and weigh ins must be during regular store hours Saturday 6 am. to 8pm. and Sunday 6 am. until 5 pm. All anglers MUST sign up before fishing. Anyone signing in on Facebook will be automaticly registered Follow this LINK to my Events Page anc click Sign In . Anyone else must sign up in the store. Sign ups will be accepted from Friday May 10th thru Friday May 17th at the annual "Customer Appreciation Sale" and prior to fishing during the tournament days. This is strictly a FUN tournament and I expect a big turn out. I will be the final judge. You know you will be fishing this weekend anyway so stop by an sign in and then bring in your fish. I'll show them all off here and on my Facebook page. If you aren't already a Facebook Fan of Absecon Bay Sportsman Center once again I suggest you CLICK HERE and LIKE the PAGE. You'll get ALL the updates as they happen every day.